FOOD & HOTEL VIETNAM 2015 was held at Saigon Exhibition and Convention Center (SECC) (21-23/4). 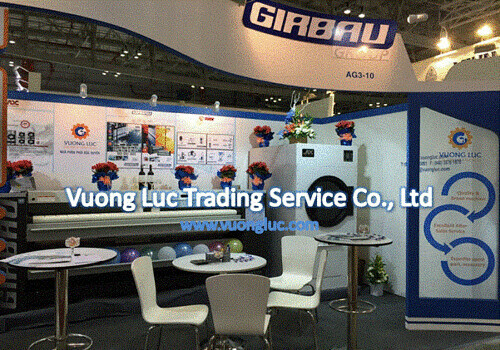 During this exhibition, VUONG LUC Ltd. exhibited new and best-selling equipment as well as introduced the catalogues of multiple famous brands such as GIRBAU, RENZACCI, ADC and PONY which the Company has exclusively distributed in Vietnam and Indochina. In this event, Ms. O My Phuong, VUONG LUC Ltd. PR & Business Development Director expressed: “We always believe that FOOD & HOTEL VIETNAM, especially, FOOD & HOTEL VIETNAM 2015 is the best exhibition for hotels, businesses, food industrial, etc. Here, we have a lot of business opportunities and feel very satisfied with the professional of the organizer as well as the diversified activities performed at the venue during the exhibition”. 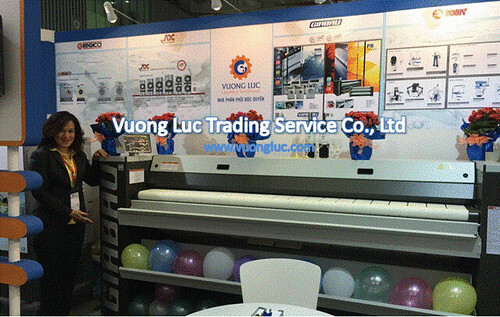 VUONG LUC Ltd. exhibited at the AG3-10 area where we introduced the several commercial products from multiple famous brands. Girbau (Spain): Vuong Luc – specializing in laundry solutions in Vietnam introduced Girbau new generation of hard-mounted washer extractors RMS/RMG Series which replace the MS/MG models. The medium speed RMS and the high average speed RMG are available from 10 to 28 kg with spin speeds of 600 rpm. Machines are available with electric and steam heating or without heating (external hot water supply). This new series is greening the world and reducing consumption by applying Aquamixer and Aquafall and Just in load technologies. In addition, we also shared our record made in 2014 “Girbau’s best sold machines in Vietnam include flatwork ironing and folding lines”. 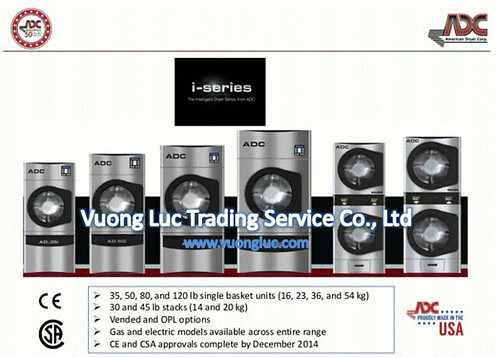 ADC (America): Vuong Luc expressed the latest advances of ADC dryer - the I series which is ADC's newest line of dryers with different capacity ranging from 35 lbs/36 kg to 120 lbs/54 kg. This new line is the best in class with an array of options from coin dryers to OPL dryers and also offering gas, electric, and steam options. Standard features include variable speed drum, pre-heat system, fully insulated cabinet, double glass door, self-cleaning lint screen, basket supported by wheels, Fire Protection System (S.A.F.E. ), single phase reversing, stainless steel basket, and stainless steel front. 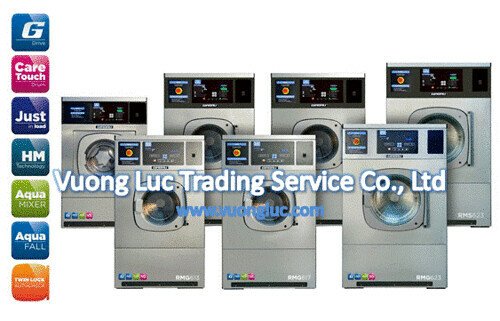 ADC is the world's largest manufacturer of dryers and offers a broad range of product. MG/MGC Universal Form Finisher for the blowing finishing of all outwear garments (60 seconds). MPT Universal pneumatic Topper Mod. is time-saving. Recommended for a general finish of the trousers which will then be finished by iron or press. BP, CP Air operated press Mod. BP and CP, utility shape boards. Jolly/Jolly S Spotting Table clean the stain with stainless steel board. In addition, PONY provides boiler and packaging machine. RENZACCI (Italy): the world’s famous manufacturer of dry cleaning machine for over 4 decades. 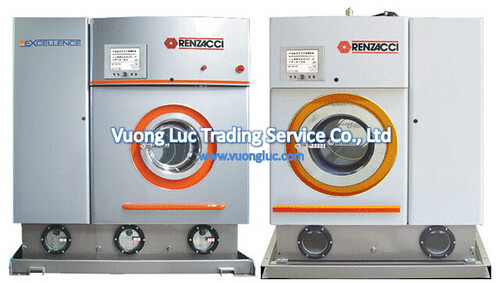 VUONG LUC Ltd. cooperated with RENZACCI. In order to, we could introduce to customers about KWL EXCELLENCE which is dry cleaning machine use hydrocarbon solvent and multisolvent. Those solvents help protect environment, instead of the previous perchlorethylene.